Boxer works just fine in the newly-released OS X 10.9 Mavericks, with the sole exception that you'll need to give Boxer permission to capture hotkeys again so that Ctrl+arrowkeys won't switch spaces while you're playing. 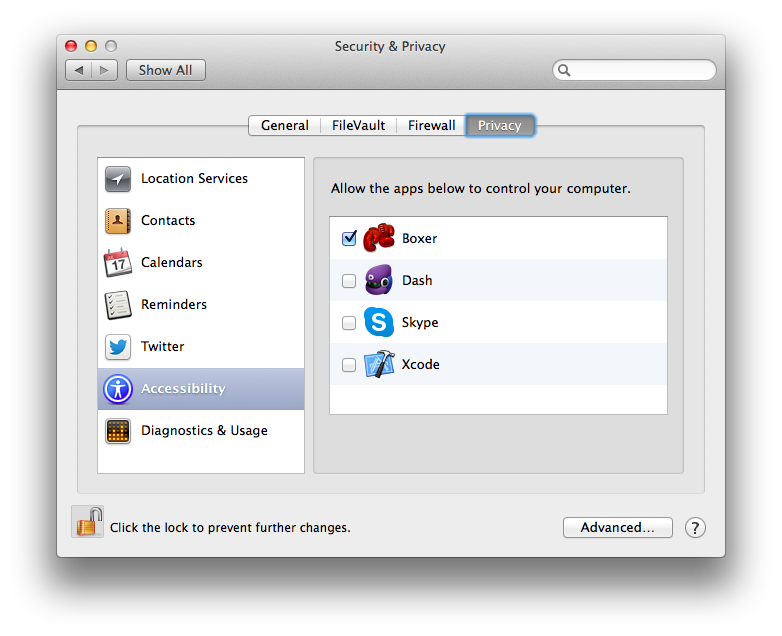 Boxer’s issue tracker has an illustrated walkthrough of how to do this but the short version is that you'll need to go into “Security & Privacy” in System Preferences, tick a box in the Privacy tab to give Boxer permission to do naughty accessibility things, and then restart Boxer. After that, everything will work the same as it always has. This also applies to any GOG.com game apps you have: those will be listed separately in the Security & Privacy pane, and must be given permission individually. When the hell is the next version coming out? Owing to mission creep Boxer 2.0 (née 1.4) turned into a balls-out rewrite of large sections of Boxer’s underlying architecture: a labour comparable to cleansing the Augean stables of 3 year’s worth of thickly encrusted cattle poo written in Objective-C. Boxer is a cleaner and less smelly codebase for it, with some powerful new systems for future growth, but there are still a number of new and existing features to be finished (which is to say “unbroken”) before it’s ready for release. More on these later. Be that as it may, where the hell have you been? The observant of you have noticed that I hadn’t posted since last December and there was a period of several months where Boxer’s repo lay suspiciously fallow. The truth is, I’ve been holed up in a Moroccan flophouse shaking off an opium addiction. Alas nothing so romantic. I burned myself out on programming in general and Boxer in particular and spent my summer recuperating, catching up on Breaking Bad, and building Doom levels in some kind of subconscious effort to out-retro myself. I’m back in action now though, and looking forward to getting the new release out the door. In my next post I’ll go over the major visible features that are coming in Boxer 2.0. With screenshots, that aren’t even of Gene Hackman.